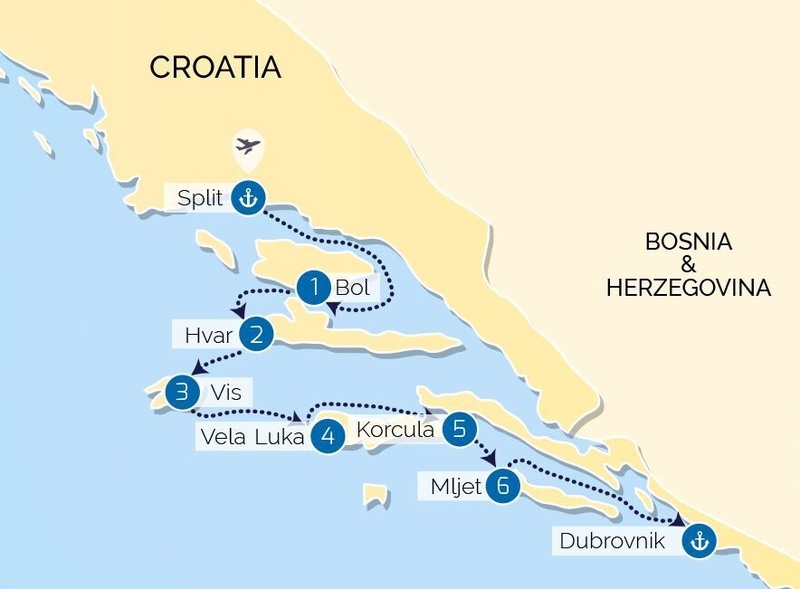 The gorgeous islands, pristine beaches, quiet harbours and beautiful towns of southern Croatia open up before you as you cruise along the Adriatic coast on a brand new luxury vessel. This is a fascinating and relaxing way to immerse yourself in the landscape, culture and history of this lovely country. This eight-day cruise takes you to some of the region’s celebrated highlights, including the extraordinary Diocletian’s Palace that still dominates life in central Split. Explore this city before sailing over to the small fishing port of Bol and its famous Golden Horn Beach. The cruise takes in Hvar, too, celebrated as a jet set destination, with an ancient fortress towering above the town and its harbour. We then sail to the less visited island of Vis, near to the islet of Bisevo. Then head to the idyllic island of Korcula, best known as the birthplace of Marco Polo. The brand new vessels that sail this cruise offer luxury small ship cruising at its best. Each takes no more than 40 passengers and has cabins with ensuite bathrooms and air-conditioning. Fresh Croatian cuisine is prepared on board using local ingredients cooked and served traditionally and you can also dine out in restaurants along the way, tucking into fresh seafood by quiet harbours and in pretty villages. There’s a spacious top deck with a splash pool, so when on board you can relax, enjoy one of the spectacular sunsets Mljet is renowned for, or just watch the Dalmatian coast drift by. The company that operate this vessel is dedicated to sustainable tourism and is passionate about raising awareness of environmental, economic and sustainable tourism policies in Croatia. Small ship cruises in Croatia help reduce the increasing pressure to build new hotels in this popular destination by providing a range of sympathetic bed space when and where it is needed. These vessel are like moveable boutique hotels and by moving from port to port they also take the pressure off the road system in some overcrowded towns and cities. These modern vessels have new engines which use less fuel and give off less emissions than older vessels. By visiting small ports along the coast we limit our cruising time and thus fuel consumption whilst maximising our guests time in port. Larger vessels cannot visit most of the small ports so they are have no choice but to sail straight past. Our vessel, on the other hand, stops at many small islands ports and towns where we can fully enjoy some of the very best that Croatia has to offer. The money that we will spend in many of these smaller communities will help to preserve the fantastic heritage of these antique coastline. Our visits to Mljet National Park & The Benedictine monastery on St Mary Isle will help preserve them by putting a little funding directly into their coffers.